Evening reach Haridwar airport/Railway Station. Pick up and transfer to hotel. On arrival check inn at hotel. Evening participate in Ganga Arti at Har ki Pauri. Overnight at hotel. Early morning you can do bathing in Ganga Ghat, back to hotel check out from hotels and depart for Barkot via Deheradun surface approx. 190Kms. Enroute halt at Deheradun or Mussoorie and visit famous local sightseeing of Deheradun or Mussoorie i.e. Ashrams, Falls and famous Kempty Fall. Afternoon continue drive to Barkot. On arriving transfer to hotel & check inn at hotel. Overnight at hotel. Early Morning leave for Hanuman Chatti via Syana Chatti and Ram Chatti by surface approx. 40 Kms. On arrival Start your journey by trek or Jeep. (Optional- Take a local jeep to reach Phool Chatti to shorten your trek by 5 Kms). Reach Pool Chatti and start your day with a tough trek of 7 Kms via Kharsali or Janki Chatti. Finally reached at Yamunotri and pray at the temple. Come back to Barkot in the evening. Overnight stay at hotel. Morning leave for Uttarkashi via Dharasu Band surface approx. drive of 90 kms. En route, stop at Dharasu Band for lunch. Afternoon reach Uttarkashi and check in at hotel. Evening visit local Temples and Market of Uttarkashi. Overnight stay in Uttarkashi. Morning depart for Gangotri 100 kms. On the way stop at Gangnani for a hot water spring dip. Continue drive towards Gangotri via Harsil. In Harshil famous for one of the most beautiful valleys in the world, Later arrive at Gangotri and take short trek to Gangotri Temple. On arrival holy dip in the sacred river Ganges, also called Bhagirathi at its origin. Perform Pooja after that and relax for some time in the lovely surroundings. Late afternoon drive back to Uttarkashi surface approx 100 kms. On arrival check in into the Hotel. After breakfast pick up your packed lunch, and leave for Gaurikund (32 KMS drive-one way). On arrival start your journey on the tough trek ahead. Stop for lunch en route and continue after that to arrive by late afternoon. 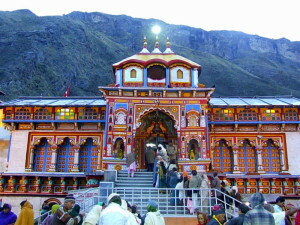 After freshening up, perform Pooja and also Darshan at Shri Kedarnathji. In the evening also visit Adi Shankaracharya Samadhi behind the temple. Overnight at Hotel. After breakfast leave for Karnaprayag via Guptkashi by road surface approx 80 kms / 3 hrs. On arrival check in at hotel. Free time you can visit River Meet. Overnight stay at Hotel. After breakfast leave for Joshimath by surface approx. 115 kms. On arrival check inn at hotel. Rest at hotel. Overnight stay at Joshimath. Today morning depart for Darshan of Badrinath Ji and spend time visiting Mana village – the last village before the Tibetan border. Return to back Joshimath hotel. Overnight stay at hotel. After breakfast depart for Rishikesh by surface approx 255 kms. On the way visit Devprayag ( The confluence of rivers Alaknanda and Bhagirathi, which become the Ganga). On arrival visit Laxamn Jhula and Ram Jhula and see the evening arati. Overnight stay at hotel. 1st Day only pick up.